Thank you to Lion Brand Yarn for providing the yarn for this sample! I recently had a chance to sample some Lion’s Pride Woolspun (by Lion Brand Yarn), and boy, was I impressed! This #5 bulky weight yarn is awesome. Sold exclusively at Michael’s stores, it’s a sturdy yarn that doesn’t split and shows stitch definition very clearly. I had been looking around for a nice bulky yarn that I could use to make a chunky version of the popular Yenni Slouch, and when I saw this yarn, I knew it would be perfect. Just look at that stitch definition! I went a little crazy and designed a matching scarf. It’s big, it’s chunky, and it’s adorable. Isn’t my model adorable, too? She rocked this photo shoot. 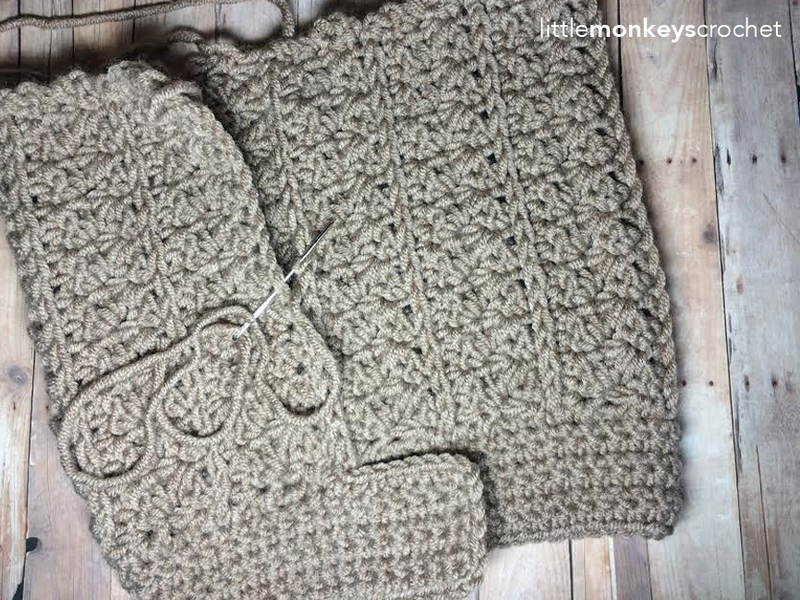 So grab your bigger hooks and join me for a quick, trendy project that will keep your head warm all winter long! 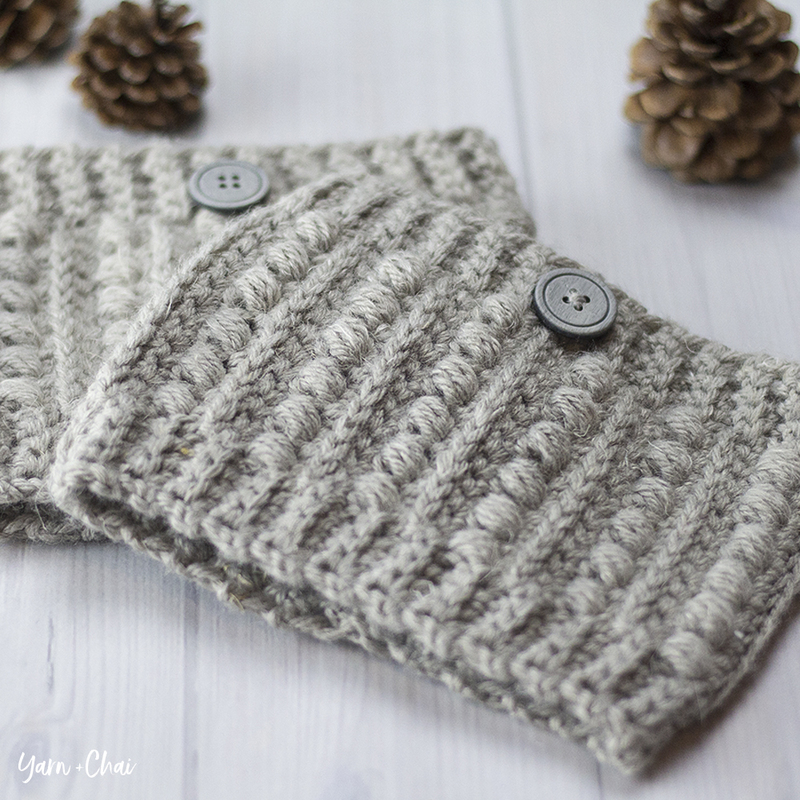 Scroll down for the free pattern, or click here to view the matching infinity scarf pattern. Hat measures 10.5” across at band, and is 10” tall. Lion's Pride Woolspun (from Lion Brand), 190-200 yards. The color in the photos is Taupe. Gauge: With N hook, a row of 7HDC = 3" in length. 3rd Loop - Some rows call for the stitches to be completed in the "3rd loop". When working in turned rows, and after completing a row of HDC, these loops will be visible just below the front loop. So instead of inserting your hook into the top loops, you'll only insert it into that 3rd loop. This will force the top loops to go to the front of your work, which is how we get the "ribbing" effect. View a tutorial here. (2) The button is just a decorative embellishment (non-functional). Using N Hook, and leaving an 18" tail, CH21. Rows 6-44: Repeat Rows 2-5, in order, until you have 44 total rows (you will end with a repeat of Row 4). Row 45: CH1, DO NOT turn. Begin to SC down the LONG edge of the project, putting 5SC in each section between ribbing rows (see photo below for a visual). You should end up with 55SC. Then, CH8 to create the base of your button flap. I absolutely love your design. Thank you for sharing it. I have 3 nieces who I will make this for. Great fashion statement. I love the yenni! I’m just about done making it. This one looks great too. And yes your model is adorable! Blown away when I saw this pattern. Exactly what I was seeing in my mind without really knowing it! Love everything about it including color and yarn choice! Beyond excited to see if I can do this. Thank you so much for sharing these patterns! I love this!! I can’t wait to make it. I love the way you write your patterns and show in so many details how to do it. You make any beginner feel comfortable trying something that looks intimidating. I usually don’t take the time to write comments, and you probably don’t need to know how awesome you are, but I had to say it. YOU’RE AWESOME!! I have been crocheting gifts for Christmas. I had NO idea what to make for my sister. I came across this pattern and fell in love with it. It was easy to read, quick and the finished product was EXACTLY the way I had hoped it would be!!! I have so many of your patterns stoed on my computer to make for family and friends!! Thank you so much for making this a free site!! Merry Christmas!! I love your pattern. Its beautiful, I would love to make it. Great easy to follow pattern and adorable hat! Thank you so much for sharing. Thank you for the pattern! I’ve been looking for something to keep my head warm and cover my hair during the winter. This is perfect…stylish and warm. It will be perfect while I await my transplant. I love this pattern! I just finished one up with Woolspun in “Peacock”. It came out perfect! Thanks! I am working on Thursday right now and this is the easiest,most concise pattern I have used in a long time! Thank you for taking the time to write this. My daughter is going to love this hat! Sorry, this hat. Not Thursday! Why don’t I proofread? I loved this pattern! It worked up quickly znd looks amazing! Thank you! 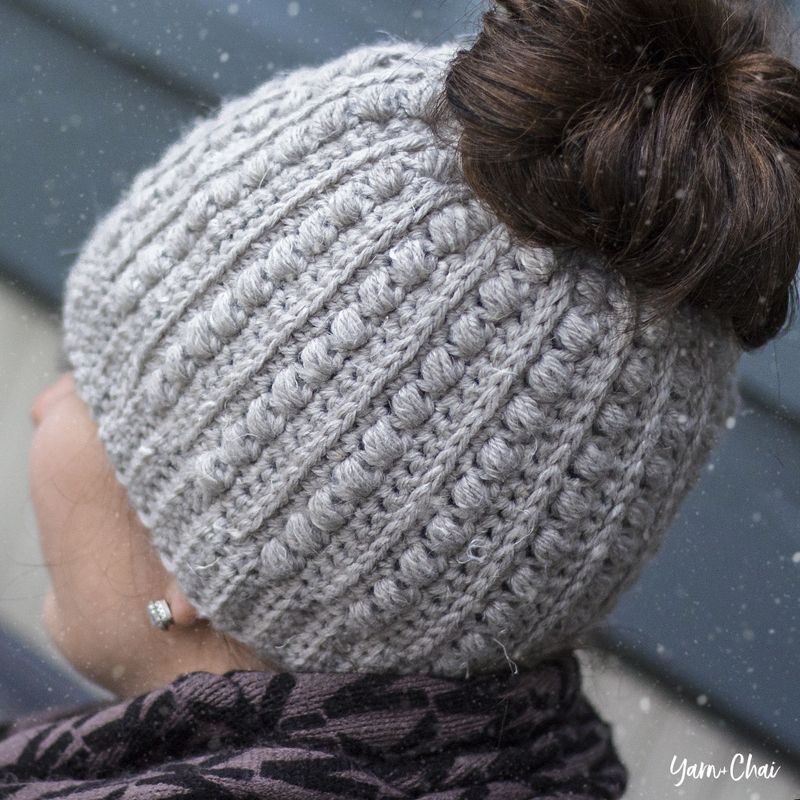 I love this slouchy hat! Love this! Is so cute! Thanks so much for all your patterns. Delighted that you are so willing to share them. Thank you!!! I so love the looks of this set! This one I have made and it works up beautifully!!! Thank you so much for sharing your talent and skill!!! You are AWESOME!!!! This is the pattern I’m working on now to donate and then I’ll be working on a set for myself. I love this pattern because it’s pretty and the slouch is nice for long or short hair, big or normal sized heads LOL. love all of your patterns – this one has easy to follow directions & turns out beautifully – love that there is a scarf to go with it also. I usually dislike slouch hats, but for some reason, this one really appeals to me. I think it is the band and button that makes it okay. I think my granddaughter needs this one! Love all your patterns but this one grabbed me. I love the texture. Am going to give this one a try as soon as I finish a few baby hats. I absolutely ADORE this hat! And nd the scarf… LOVE!!! I have been making Christmas presents for everyone else recently, so I’m excited for finally have some time to make something for myself.. Next up on my to-do list, yes, please! Wow thanks for such a great pattern, can’t wait to finish what I’m working on now and get started on the hat! I absolutely love this set. It’s modern and hip yet classic too. I can’t wait to make this! Love this hat pattern! I made it in a slightly heavier yarn (#6) and made the band in a contrasting color (its row of sc was in main color). Looks great and I have received lots of complements. Best of all, I made it in one evening! Now to make some coordinating mittens. Great warm winter Slouch Hat. I love this whole set. It looks fantastic! I absolutely love this hat! I can’t wait to make it! I love this hat and can’t wait to start making one for myself. I just have a question about the hook. I apologize now….. I’m only new to crochet! I have an M hook that is 9mm. Your pattern calls for an N hook which is 9mm, but N hooks I’ve searched for are 10mm. So I just wanted to clarify … Is it a 9mm or 10mm hook that I need for this pattern? Thank you. Awesome hat, thanks for sharing your wonderful creations!! Love this! Can’t wait to make it. Cute hat! I will have to try it out! Ohh.. I love the rustic slouch hat. SO pretty! I love the rustic slouch!! And the matching scarf is gorgeous! love this design – looks very casual or dressing up a basic tee for going out! Love this hat and scarf! It’s an awesome pattern, thank you. can I use a different yarn and if so what kind. I can’t wear or use wool, allergic to it. You can use any #5 weight (chunky) yarn. I would look for something smooth that will show off the stitch definition well. Haha! Me too!! Actually I made both mistakes… I used a size 10mm (N) hook, with a super bulky size 5 yarn and the hat is huuuuge? Love this! I’ve been looking for patterns to use up done of my stash of this yarn in discontinued colors. I just made this (and the matching scarf) for my sister in a gray heather. I added a white fur pom pom to it and I am in LOVE!!!! Seriously thinking I want it for MYSELF!!! Thank you so much for sharing your talent! My daughter would love this slouch hat! I need to practice some of the stitches before I attempt it, though! Great photos along with the instructions. Thanks. Thank you so much for this great pattern. I’m having a problem with the Hat. I am using the yarn and hook you specified, my gauge works out too, however, for some reason the hat just doesn’t want to lay as nicely as shown on the model. The slouch is too large. I’m wondering if I use a smaller hook if that would change the look of the slouch. This yarn is a (5) bulky weight, yet, to me it seems as if it’s very similar to Red Hearts “LOVE” yarn. I have other (5) weight yarn that is bulkier, from Lion Brand. I also made the cowl, when you sew it together, did you twist it?? It seems to lay too bulky around the back of the neck. Any assistance is greatly appreciated. Thank you again for a wonderful pattern. Everyone’s heads are different, it may lay different on you because your head is shaped different, or is smaller than the model’s. You can do fewer repeats before you get to the band to make it smaller, or CH fewer on the initial chain to make it less slouchy. I’m not sure what to tell you on the yarn — I felt like Woolspun was a true #5 weight. No, there was no twist on the scarf. It’s an oversized statement scarf so putting it on so it doesn’t bulk up too much in the back might just take some practice. The button flap came out on the other side what did I do wrong? Not sure, but you can just wear the button on the other side of your head and the flap will be pointing down. I completed the rustic slouch hat in Oxford gray and love it. Can’t wait for my granddaughter to receive it! And I am ready now to make another one! Thank you for your design! Lovely! But need some help with stitch counts after the 44th row. Directions say to crochet 5sc per section between ribs. I have 8 ribs and 9 sections (44 rows), so i end up with 45sc, not 55sc down each long side. (9×5). What am I missing? Thank you! Hi Donna — you should have 11 sections. Each section is 4 rows (4×11=44). Hi, I’m sorry but I do not understand how many balls you use to pick your cup. My English is basic. I LOVE this pattern!. So easy yet also stylin’! Thank you! Thank you very much for this gorgeous slouch hat pattern. I was looking for a “perfect hat” that covers my entire head and ears, and still looks cute, this was it. I made it with #5 yarn (new wool) and 9mm hook, then it was too bulky. So, I unwoven all and started over using 8mm hook. It worked perfectly in my case… With 9mm hook, it measured 29cm x 60cm (without button part), with 8mm it was 26cm x 53cm. And my head is larger. Now I’ll try a cowl using the same pattern. The smaller the hook you use, the stiffer your finished product will be. If you’re going to go down that far in size I would recommend switching to a #4 yarn, as well. But you’ll need to adjust your starting chain quite a bit to get the right finished measurements. Hello! I absolutely LOVE this pattern, but I crochet rather tightly. Is there a way to increase the initial chain number for a larger hat? Is it a multiple of 2 plus 3? Any odd number will work fine. Not sure what you mean by staggered. The rows do have a scalloped look to them (seaming and edging will take care of that), but as a whole, the edge should be straight, not running on an angle. That is what is happening for me as well 🙁 I don’t know what I am doing wrong 🙁 I wish you could take picture and show you… one question – on Row 5 it states to work in 3rd loops & then in parenthesis it states to skip a stitch. .. . Don’t know if that would clear up this “staggered” effect? If you don’t skip that stitch, you’re going to mess up the pattern. As I said to the above commenter, seaming and edging will take care of the staggered look, if you’re referring to the ends of the rows. You’re welcome to email me a photo. I don’t know what happened but it’s too small. And I usually have to downsize my hook because I crochet so loosely, but I didn’t this time and it doesn’t fit around my head. Too bad because it’s really cute. I also didn’t like how the 3rd loop row worked pulling a big loose loop while working it. Mine was too small too! It fit my 19mo old! How do I make it bigger? Did you do a gauge check? If you want to make this one bigger without starting over, you could frog the band and just add more rows to the flat piece before moving on to the band. Yes I thought I had it right but I guess no lol. I think I’ll just add extra rows because I don’t want to go up hook sizes. Thank you! Does the turning chain count in the 20 stitches? I having trouble counting my stitches. Am I to count 20, 10 sc+dc, as I crochet across each row? It’s the turning chain that’s throwing me off, it’s so high and fat and gets pulled down into the row after I skip the first stitch. I just can’t figure out how to count it, or if I’m supposed to count it. Thanks. Sorry, I forgot to say, my sides looked scalloped, not straight as I moved up the rows. I just ripped out about 25 rows and I’m starting over. No it doesn’t, I need to add that to the pattern notes. I’d say if you’ve made chunky hats before and found them uncomfortable, I wouldn’t make this pattern. I’m from Ontario, Canada. This hat is wonderful. I’ll be crocheting it for a charitable craft sale and will be putting your name and website on the attached card. The charity is a fundraiser to help Sub-Saharan African Grandmothers help raise their orphaned grandchildren. See our website http://www.granaurora.ca for more information. Thanks for sharing! I’m using a super bulky yarn and think that 44 rows of the pattern might be too big. Do you know the approx. inches of how long I should go before switching hooks to complete the brim section? Yes, using a #6 yarn will definitely yield a larger result. Aim for your flat piece to measure about 20-21″ long. Great, thanks! I used a 7 mm hook with the super bulky #6 yarn and the pattern brings my flat piece to 20″. Perfect! I love the look of your hat and am working on it now. I do not know if it is me but I am having difficulty understanding the repeat of the rows. At the beginning of the hat, you have row 1, 2 and 3 that have the sc, dc in the same stitch, when you get to row 6 you want us to repeat rows 2-5. That only puts 2 rows with the sc, dc in the same stitch, so it appears the first space is larger to the rib than the following. What am I missing? Hopefully you understand what I am trying to say. Thank you for your help. My sister sent me a pic of this page. She wanted this set. I’m not that great at reading so the video was very helpful for the one part I was trying to figure out. It came out perfectly. I’m going to make myself a set. I used a different yarn though but that yarn is also sold only at Michaels. This hat is absolutely beautiful ! Love the detail ! Thank you for the pattern !!! I have made 3 hats and 1 hat /scarf set !! Hi, love the pattern. I am new to crocheting and I learn from watching YouTube videos. I noticed you have a video for the infinity scarf, is there any way you can do one for the rustic slouch hat? My sister will be going through chemo soon and she fell in love with this hat. Thank you so much. It won’t be any time soon, but they are constructed the same way; if you need help with the stitches, you could watch the scarf tutorial and get a lot of help. I crocheted this set for my granddaughter, and now my daughter wants a set, so I’ll have to order the more yarn. As I live in Australia, using Michael’s shop wasn’t available as he doesn’t post overseas. I went to Yarnsub and chose yarn that was suggested there. I did well making the set, however I feel the designer’s hat and cowl’s yarn was more definite and the stitches were more defined than mine. Just wondering if by any chance the pattern is in spanish? Im a begginer and t would be easier for me to follow up in spanish. I just finished the hat in two days, the pattern is amazing, and it looks great. Definitely going to crochet it for my friends as gifts. Thank you for the amazing design and the easy to follow tutorial/pattern. Would you happen to have this hat pattern for knitter’s ? I can only knit and would LOVE to make this hat!! What a beautiful hat ! Thank you for creating such an easy to follow pattern. I’m a beginner crocheter, and I made this hat!!!! I’m excited to try your other patterns. Super cute, I am adding this to my group of hats I make every year for our ladies group to hand out to the homeless. Everyone deserves such style! Thx much! Is one of the SC “ON” the rib or is it strictly between the ribbing rows? I went strictly between, but it probably wouldn’t make that much of a difference. Love this pattern and I am trying to follow it but one thing keeps confusing me. It says to skip a stitch and then single and double crochet in the same one across and you should have 20 stitches. So I am doing the skip stitch and then sc and dc all the way across but I’m not getting 20 stitches. Its more like 17 so am I reading it wrong? Hi Leah, I’m not sure what it is you’re doing. But, the pattern ends with 20 stitches every row. The reason this works out is because the repeat of (Sk next ST, SC+DC in next ST) is still a 1:1 ratio (by skipping a stitch and then putting an SC AND a DC in the following stitch, you’re still ending up with 2 stitches on top of 2 stitches). I’m not sure how you are getting 17. How do you convert this pattern using yarn that is 4 weight? I have lots of 4 weight yarn laying around and would rather use it than buy more yarn. Why am I only get 45 sc along the rib? Should it be 45 or 55? It should be 55. 🙂 Either you aren’t putting 5 in each section, or you didn’t crochet enough sections. How does 44 rows equal 55 stitches? And the picture states each section has 5. Even if I’m short on sections, adding more won’t equal 55. Is there a video of this? I hope there is!!!!!! Hi Becca! So glad you’re enjoying the Pass. Thank you for the quick reply! Love this hat! PS I recently finished the South Haven slouch hat and that one looks nice on my big head too! Lol love your patterns so much! Thank you for sharing. I just finished my hat and I am very happy with the results. Hello. Love the pattern. I do have a question though…. could this be made with alpaca wool? I have 4 skeins I’m dying to use. Thank you so much for sharing this pattern! I have made the scarf and the matching hat for my cousin, in college and I have people asking me if I can make it for them too, so I am going to be super busy, but this is such an easy and fun pattern to make. Thanks again!!! 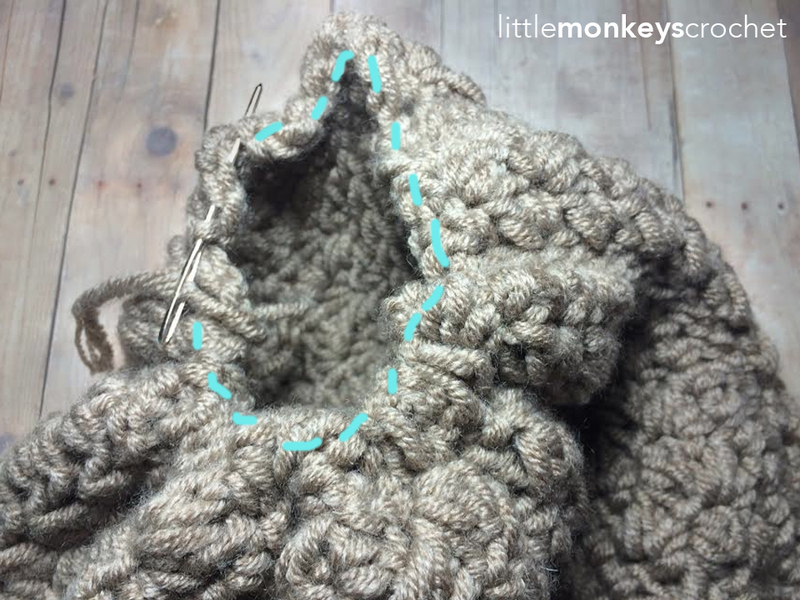 If I use a smaller hook, will I need to add more stitches? j’adore ce patron je vais surement le faire ainsi que le foulard et merci de donner vos modèles gratuits vous être très généreuse merci encore. The only way to answer that question accurately is for you to do a gauge swatch, but my guess is that a J hook will be way too small — both in overall size of the hat, and in the stiffness it will create in the fabric. So even if you added to the beginning chain to account for the size difference, you may still end up with a stiff hat that doesn’t drape very well. This pattern is very well written. I appreciate it!! 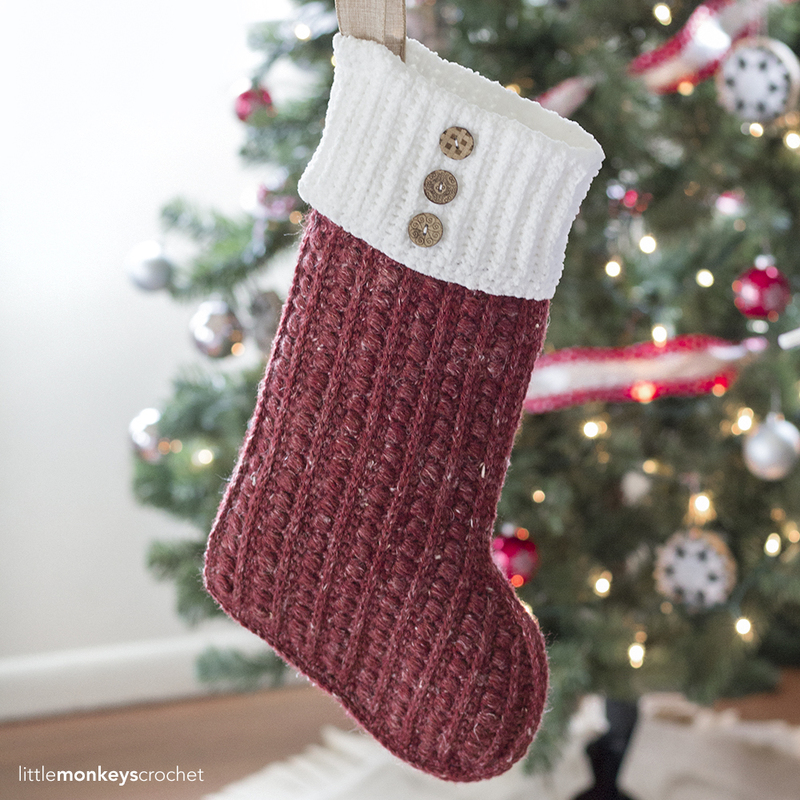 Thanks for sharing this pattern with all of us, will make them for Christmas. Presents for the Grand daughters this year, thanks again!!!! Hi. Absolutely love this pattern for the rustic slouch!!! Any chance you have a suggestion of how to make it more toddler to young girl size?? Thanks so much!!!! Since this hat is worked flat, it’s a little easier to figure out than one worked in the round… you’ll need to look up the standard measurements for a toddler hat, and aim to have your flat piece fit those measurements. (You’ll need to adjust your starting chain and number of rows accordingly.) Don’t forget that you’ll be adding a band at the end, and that will add height. This is beautiful! Is there a way to adjust it for a toddler? Hi. I’m making the rustic slouch hat and am a bit confused with step 5. Your tutorial for from loop is for hdc not sc dc in every other. I find it pulls /stretches the stitch and how do you finish the row? It’s left kinda hanging I’ve modified the pattern to be sc hdc into actual stitch. Can you tell me what I’m missing ? Hi. I was wondering if you had a tutorial on how to make the sc + dc together. Not quite understanding what that means. The way I do it, it always makes an extra stitch. Thank you. That way your 1:1 stitch ratio is still 1:1, you’re just doing 0 stitches, then 2, then 0, then 2, which works out the same. I really wish you would sell the pdf on ravelry. Your blog is too hard to read on my phone, and I I didn’t want to sign up there. I’ll try later when I’m on my computer instead of my phone. The hat is really cute! 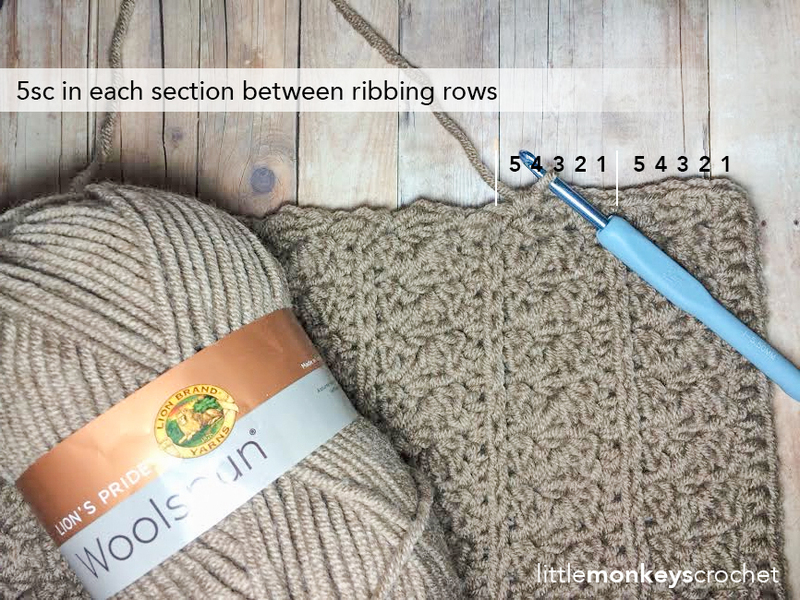 Count your rows, be sure you did enough, and be sure you’re putting 5SC between each row of ribbing. Regarding the CH8, if you’re chaining 8 and then putting an SC in the 2nd CH from your hook and in each remaining CH, that should bring you back to the body of the hat. Those chains are what will create the button flap. am I to put a sc in the 2nd ch from the hook in the 8 stitches though? In the CH8? Yes. It’s just like when you make a starting chain for a blanket (for example). You make a chain of a certain length, then go back the other direction by making a stitch (usually) in the 2nd CH from the hook and in each remaining chain. That’s all we’re doing here. I made the rustic scarf and love it. I’m now trying the hat. My yarn is a little smaller. What is the height of the rectangle before starting the band? I’m trying to figure out how many chains I neex to start with. I saw the finished length should be 21 inches. I don’t have a finished hat to reference but I’m going to guess that the band was about 1.5 – 2″ thick, so between 8 – 8.5″ for the height of the rectangle. I love the look of this hat! Thanks for sharing the pattern. I’m working on it right now… I’m having a difficult time with the repeats of the rows… when only repeating rows 2-5 the ribbing doesn’t always end up on the same side. Is it supposed to be repeating row 1-5…? To me it seems to work better that way..
I’m not sure where you’re going wrong, but mathematically, it would be impossible for the ribbing to end up on opposite sides. The repeat is 4 rows long, an even number. So every time you get back to Row 2 (the first row of the repeat), you’re going to be on the same side you were the last time you did Row 2. I found your pattern for the slouch hat on Pinterest. Thank you so much for sharing it’s one of the nicest I’ve seen and will be recommending friends to your website. The hat seems too big for my head. Is there away to cinch it in a bit? You could try doing the band in a smaller hook, or try to overlap the button flap more? Thank you so very much for sharing your pattern free. I can’t wait to make the hat. Greetings! I am very interested in learning how to make this and I am in the process of gathering the supplies. I wanted to know if I could get the same result using Lion Brand Yarn 620-403A Wool-Ease Yarn? I am trying to get the Woolspun but my local store doesn’t have them right now and I am looking for it online without having to spend an arm, and a leg, and a part of my soul. Haha! I appreciate your feedback! Wool-Ease is a #4 worsted yarn, and this pattern calls for a #5 chunky. You could use Wool-Ease Chunky instead. Just be sure to do a gauge check (you should do that even if you’re using the same yarn I did). Thank you so much for including the gauge. After working up a swatch I ended up using a 6.5 mm Bates hook. I’m making this now. I have been looking for a hat like this forever but couldn’t find one I really liked. This one is amazing!! I fell in love with it! The pattern is so easy to follow as well! Thank you so very much!!! Hello love your patterns!! 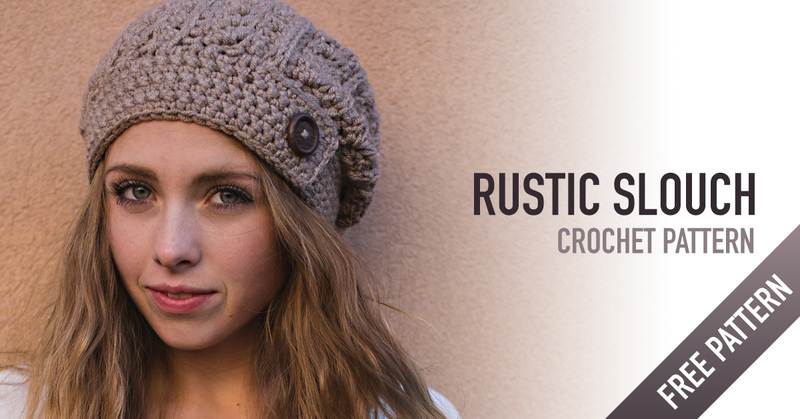 I was wondering if you will ever post a video tutorial of the rustic hat!? It’s amazing but I’m a beginner and I can’t follow a pattern yet. Please let me know if you do. Thanks and congrats on your new bundle of love!!! Can you tell me how long the 44 rows should be (before I start the sc)? I tend to crochet a little big and I don’t want it to end up huge! I am not quite at 44 and it seems big on me if I wrap it as is around my head. I know with sc it will get tighter, but thought I’d ask. Thanks in advance. I loved your hat pattern!! I am 17 years old and love crocheting, so when I saw the pattern, it was to adorable to resist making! 🙂 This is such a creative pattern and I can’t wait to wear this hat the next time I go out! Thank you so much for this beautiful pattern and congratulations on the birth of little Henry!! Best of luck with the new addition! Congratulations On your new addition. I just made your hat and I love it. Your very good with explanations and I like the illustrations as you go. I’m terrible at reading crochet patterns, but you did great. Thank you. As as beginner, I love this pattern! and your help with with explanations.. I wish you all the best with your new addition.. love and joy! I really love the patterns for this hat and the scarf , im wondering if using the size 6 bulky yarn that i have will mess up the patterns or if i just need to adjust it somehow? It will come out larger and probably stiff. Congrats on newest monkey! My daughter in law sent me this pattern and I made the scarf. What fun! Can’t wait to see if she likes it as much as I enjoyed making it. Really appreciate your video instructions!!! Thank you. Congratulations on your new baby! I’ve just finished a lovely block stitch ( with a bobble stitch edge) baby blanket for a church friend of mine who had her little boy Jan 10! I love making baby things and don’t get the chance very often! Best wishes! Well, I’ve been looking for a pattern to make for my 9 year old little sister, and when I showed her this one she instantly fell in love with it and wouldn’t let me make her any other hat ?? How do you think I can change the size so it’d fit her? You would need to figure out the desired finished measurements and then adapt the flat piece accordingly, keeping in mind that the band will add 1.5-2″ at the end. Gorgeous patterns. Just stumbled upon your blog and I can’t wait to try my hands at one of your patterns. Can I use size 4 yarn and its matching hook without changing on the pattern? I wish I could understand how to read this pattern. I’m new to crocheting and really want to make this hat but the pattern reads like a foreign language to me! An accompanying video would be great but I know Henry is likely keeping you very busy. I am in love with this hat and have received so many compliments on it. I plan to make another in a different color!! My N hook is a 10.00 mm. You said yours is a 9.00. Is this correct? Yes. It just depends on what brand of hook you’re using. N hooks and G hooks tend to be the most common hooks that have different measurements from brand to brand. Thank you!! I love it, but did u have video tutorial?? I took a course on Craftsy to get me started with basic crochet and reading patterns – but I still don’t have pattern reading ‘down’ yet. I think I’ll give it another shot and see if I can figure it out. (sigh). I have gotten very good at making granny squares though. I have a nasty head cold and was in all weekend and worked on a throw for my couch which is one giant granny square, then made some smaller ones to make a ‘patchwork throw’ eventually. I want to give this hat another shot while it’s still cool enough to wear it. Wish me luck! Granted I am very new to crocheting, and all the posts I read were enthusiastic exclamations of success at the results, but I went out to buy the right size crochet tonight (in Canada), and found a discrepancy. I could either get an M hook of 9mm, or an N hook of 10mm. I don’t have the experience to gauge and adjust a pattern… Help pls! Which size should I use? Regarding the hook, there are discrepancies between brands. You’ll mostly find this with N hooks and G hooks. My N hook is a 9mm. Always go by the mm measurement (not the letter) if you aren’t sure, because millimeters are universal. HOWEVER 🙂 Even if you use the exact same hook size and yarn as I did, your hat could still end up too large or too small, and that’s why I also want to address the gauge thing. 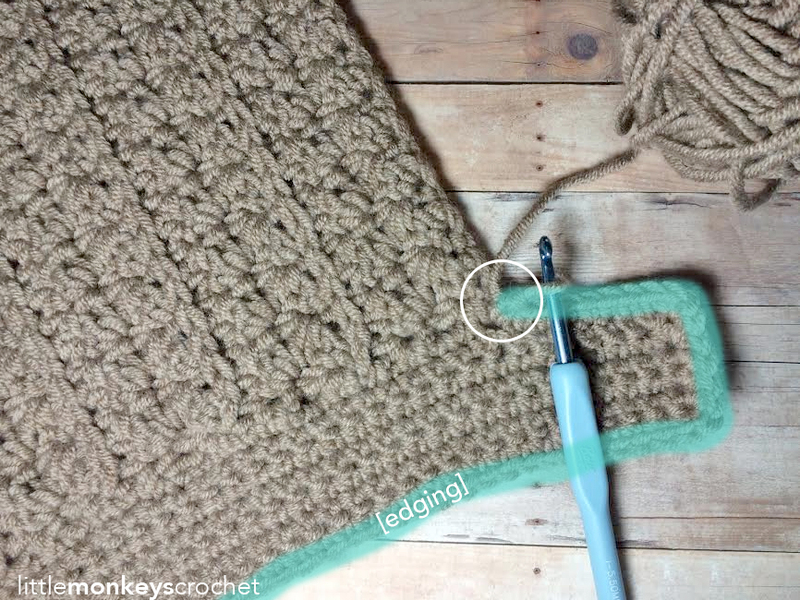 There isn’t anything advanced about it and it is SO important to understand, but unfortunately it isn’t often taught to beginner crocheters (or they are self-taught and don’t even know they need to know it). Everyone crochets with different tensions. That’s why we can crochet the same pattern with the same yarn and the same hook and have different results. There’s no right or wrong gauge, everyone is just different. That’s why we include gauges on our patterns, because if you crochet looser or tighter than I do, I want you to still have success with the pattern. So what you’ll do is simply make a “gauge swatch” according to the instructions provided, then measure it. If it’s bigger than what the gauge says it should be, go down a hook size. If it’s smaller, go up a hook size. You’re simply finding the right hook size to match the designer’s gauge so that you can get the designer’s results. Thank you so much for this wonderful pattern! This past week I made a beautiful forest green hat with a wooden button, and a sparkly sea blue hat with a continuous band rather than the flap (to save yarn and not start a new skein). Unbelievably comfortable fit for my amateur abilities. Imagining more! Thank you for this well written pattern and the helpful photos. The pattern is acurate, easy to follow and I am extremely pleased with the results of my efforts. I used Burrow yarn, a blend of acrylic and wool, from Willow. It has excellent stitch definition and is easy to work with. The hat fits well and is very attractive, in my humble opinion. This design is a definite winner. Hi. Can you do this on a video tutorial please? Perhaps at some point, but it won’t be in the near future. Have you viewed the tutorial for the matching scarf? The patterns are so similar, you might glean all you need from that video to complete this pattern. I cant wait to get started! I appologize I am very new to crochet. On row 1, i started on the 3rd stitch and im a little confused with the parenthesis then it says (20). I would love to make this for a 10 year old but I’m awful at figuring out how much to decrease. Please help! How much would I decrease to make this for a 10 year old? I’m awful at math! I am currently working on this hat, and every row I am seeing that my hat is increasing acrosss, it does not stay 20 stitches across for all of the rows. That does mean something has gone wron? Should it remain 20 stitches across when I am on row 30? No, it shouldn’t be increasing. 🙂 Are you skipping a stitch between each combo stitch? Absolutely gorgeous, your work and your model! Glad to have found your blog! I purchased the rustic hat and scarf pattern from you a long time ago and just now trying to do the hat. Scarf worked out great, having problems with doing the hat. Do you have a you tube for the hat? Would appreciate any help I could get. Thank you. I don’t, sorry! At what point are you running into trouble? Hi Jessica! Unfortunately I am unable to do that at this time. My name is Corinne, I live in flinton Ontario Canada and I have a question for you. On fow 45 at the end you say we should have 55 sc, I have done the 45 row and only get 45 sc. Is this an error or do I need to add another 2-5 rows x2 to give me 55 row, then when I sc between ribbing and total number of 5 sc I will then have 55 sc completed. Oh and by the way I love this design, BEAUTIFUL. THANK YOU! Hi Corinne! Read the instruction closer – it says that you should put *5* SC in each section. Each section is comprised of 4 rows. (See the provided photo for a visual.) So if you have 11 sections, and you put 5 SC in each, you should have (11×5=) 55. I am a very experienced crocheter and I have tried this pattern several times. 10.5″ around is not proper for a hat for an adult. 22-25″ is the right size. The 1st 3 rows do not make the rib stitch. I have had to rewrite the whole pattern to make it look like the picture. And double the stitches to make it fit my head and I have a small head. I am using bulky yarn with the N hook. Perhaps you need to rework the pattern again and make adjustments. While I certainly appreciate your feedback, I am puzzled. Perhaps you might consider reading through the many, many comments above yours that praise the pattern, written by people who completed it with no problem. 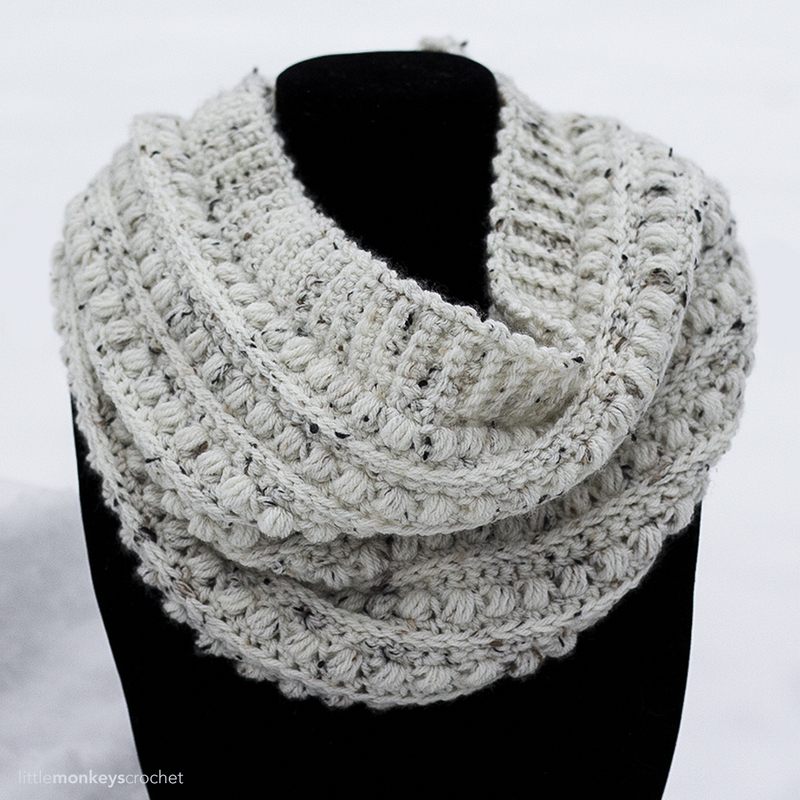 If you’d like proof that the stitch pattern works, you’re welcome to click over to the matching scarf and watch the tutorial video, as that scarf is written with the same stitch pattern as this slouch. And regarding the sizing… the average circumference of an adult MAN’s head is 23-24 inches, and to account for stretch, you would want to work up a hat that is 1-2 inches smaller than the circumference of the intended head. So I cannot imagine making a hat 25″ for a woman (or a man, for that matter). Hey there Rebecca. I have fallen in love with your website and have found numerous patterns that I can’t wait to try out. This has been my first attempt at creating one of your works, and have to admit that although you make it very easy to follow, I’m getting lost at the number of rows to make. You went from rows 1-44, and added the CH8 for the flap which gave me a total of 52 SC down the side. Not 62. It looks like we need 10 more rows. I’m going to make this pattern again doing rows 1-54 as 1-44, to give me the 62 i need own the edge. I think those extra inches will really help, as it is too small for an average woman’s head. Love your designs. I’ll let you know if this fixes the problem. I think this is the same issue that your last response was indicating. Oh. Well, I don’t see how that works out actually. If you have 44 rows, that equates to 9 individual sections between ribbing. So then if there are 5 stitches in each section between ribbing, 9*5=45. Take that and add the flap: 45+7=52. Anyway, I ended working up 54 rows (totaling 11 sections. 11*5=55). The hat came out fitting much more comfortably and looks super cute. Thank you for the work! I think where you are confusing the numbers is with the “5 SC per section” instructions. There are not 5 rows per section, there are 4. We are not putting an SC in every row. Boy don’t I feel dumb. You’re absolutely right. I was confusing myself over the number of rows. For some reason, I was adding row 1 into my math. I ended up making your pattern exactly, and that’s what turned out looking great! Thank you, again, for the great pattern! I’ve made 3 slouchies with it so far, and everyone loves them! I thought I had spruced up your pattern a bit, but no, I was doing exactly what you instructed without realizing it. Take care, and can’t wait to see what else you have in store for us. I fell in love with this pattern! Actually am thinking of making it for myself or my Daughter who lives in Germany right now. Can you recommend a comparable yarn? I never go to Michaels and was thinking of making it on the plane to Germany or while I’m there for a month. I leave on 11/28/17 to be with my Daughter and son in law for the birth of our first Grandchild, a girl due December 7th. Ordering online will take too long to get to me. Joann’s doesn’t carry the Woolspun. Thanks for an amazing pattern! Can’t wait to make it ? Hi Michelle! I’m not sure what to recommend as far as super similar yarns, because the ones I can think of either come from Michaels, or require ordering. I know people have made this pattern with Wool-Ease Chunky and Hobby Lobby I Love This Chunky, if that helps! Thank you! I will try Hobby Lobby ? My first questions would be, what yarn did you use, and did you do a gauge check? Just finished this pattern in a chunky green yarn and it is stunning! Easy pattern to follow. Thank you for the free pattern! Hi I just made it. Love it looks great and thanks for the awesome pattern. Just a quick question though. Mine is quite stiff even though my tention is quite loose. Once I wash it. Will it be less stiff? There is no video tutorial for the hat. Hi lovely pattern. Thanks for sharing. I don’t have one to measure but I’m guessing about 22″. Thank you and welcome to Henry James! I love your pattern! I just finished making it in Loops & Threads Barcelona colour Arctic. It worked up perfect and it is my all time favourite hat now. I am attempting to make it again in a 4 weight yarn too see if i can do it as I have some really pretty colours that I would love to use. I am using your measurements as a guide so hopefully it turns out ok. Thank you for sharing your patterns with us! I LOVE this hat! I can’t wait to make it. Thank you! I am having a problem with the pattern. At row 45, you state to put 55SC up the long edge. I think there’s a mistake there or I am misunderstanding. You only have 44 rows, with 8 ribs between them at this point. I only get 45 SC. I put in 5 SC before the first rib, 5 SC between each rib for a total of 35 SC and 5 SC after the last rib since we ended on the HDC row. What am I doing wrong? Please ignore my previous comment! I went back and saw where you had answered this question for someone else who was making the same mistake I was! Thanks! I love your pretty work and i think so you are more pretty than slouch….So cute smile honey….Keep smiling. …you need to skip a stitch, SC+DC in the next, skip the next, SC+DC in the next, etc. The skipped stitch balances out the two-stitch combo. I love your designs and can’t wait to try recreating one for my self! You need to repeat everything in the parentheses, including the skipped stitch. So, skip a stitch, SC+DC in next, skip a stitch, SC+DC in next, etc. You will have 20 stitches if you do that. I made one hat and it was huge so I pulled it out and remade it using a “K” hook. That one came out just right but I think part of the problem was the brand of #5 bulky that I used. I love the pattern tho and made 2 hats in one day! Hello! I used a K hook and my hat is 14 in tall and is still way too small. Is your pattern in American English?? Yes it is. 🙂 You can always measure your 14″ hat to find out how many stitches are in the correct amount of inches, then start with a chain closer to that. Just make sure your row stitch counts are an even number. Hello !! 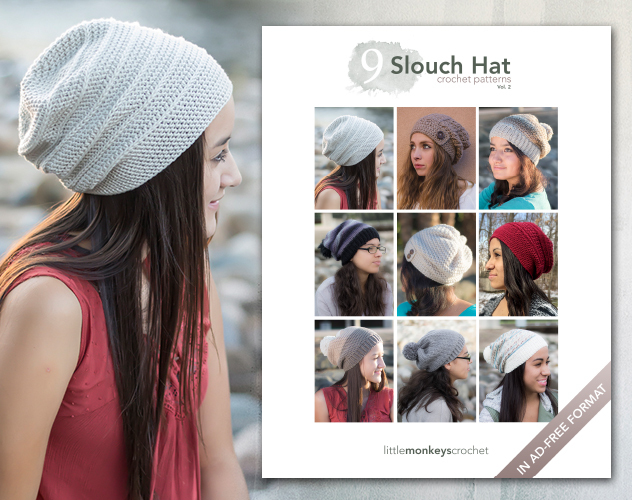 I have a question about your slouchy hat pattern if that’s okay! On row 45 it says that you should have 55 single crochets along the long side of the hat. But if there are only 45 rows with five single crochets in between each section wouldn’t that only add up to 45 single crochets? I’ve racked my brain the entire day and I figured asking the designer would be best :). Thank you in advance ! I’m using a smaller hook and a lighter weight of yarn. Does the 10″ tall measurement include the band? If so, what should the measurement of the band be? Thank you. I love your patterns. Hi, I did the gauge first and it was perfect. Now, I have repeated row 2-5, 2 times, but it seems so small. The width is about 9 inch. I am using another brand of yarn, ’cause here in the Netherlands they don’t sell Lion yarn. Am I doing something wrong?